Sadly I have yet to visit Austria’s vineyards, but I greatly admire the wines they produce and what I have seen of Austria appeals to me immensely. 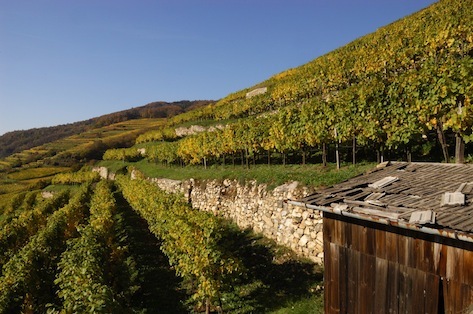 I am especially drawn to Austria’s signature grape – Grüner Veltliner. Some of you will know that I am keen for people to drink a wider spread of grape varieties than the normal small group of suspects, so I am excited that Grüner is starting to break through in the UK. Apparently it has become so popular in the United States that the trendy set over there call it ‘Grü-Vee’ – strangely predictive text makes it more time consuming to type or text Grü-Vee than to actually give the grape it’s proper name. I sort of know what Jancis meant, the grape does produce a type of wine that is easy to enjoy, it can be very direct and pleasurable and for me this puts it on my list of the white grapes whose time has come – indeed in many ways it is the standard bearer of these grapes. I really do think that the quality of most wines has improved since Vines, Grapes and Wines was published in 1986 as growing techniques and winemaking skills have developed and this is especially obvious in fresh, dry white wines. I could list a huge array of white wines that have improved beyond all recognition during my time in the wine trade, chief amongst them would be the wonderful whites of Galicia in Spain, Italy’s Verdicchio, Friuli and modern German wines as well as the seldom seen wines of Slovenia, Jura, Savoie, Luxembourg and the French Moselle region. I could also add Switzerland and the Alto-Adige in northern Italy to the list for good measure, but it is Austria’s Grüner Veltliner that is starting to enjoy real success and is hopefully breaching the walls of the Sauvignon Blanc and Pinot Grigio obsessed wine market. As a keen amateur historian I find it fascinating that Grüner Veltliner takes the main part of its name from the Valtellina Valley in Lombardy. Clearly Italian today the area was part of Austria until 1859, so the name was a close run thing as the first reference to it only dates back to 1855 – before that the grape was called Weißgipfler and it was not generally known as Grüner Veltliner until the 1930’s when it started to emerge as Austria’s star grape. By the way the grape is still grown in Italy in the Südtirol-Alto Adige’s Eistacktal (Eisack Valley) which was Austrian until 1918 – interestingly one of Grüner’s parents is the Traminer grape which (probably) comes from Tramin, also in the Südtirol. No one knew what the other parent was until a single unknown, ancient and struggling vine was discovered on some untended land in St. Georgen near Eisenstadt in Burgenland, near the Neusiedler See. 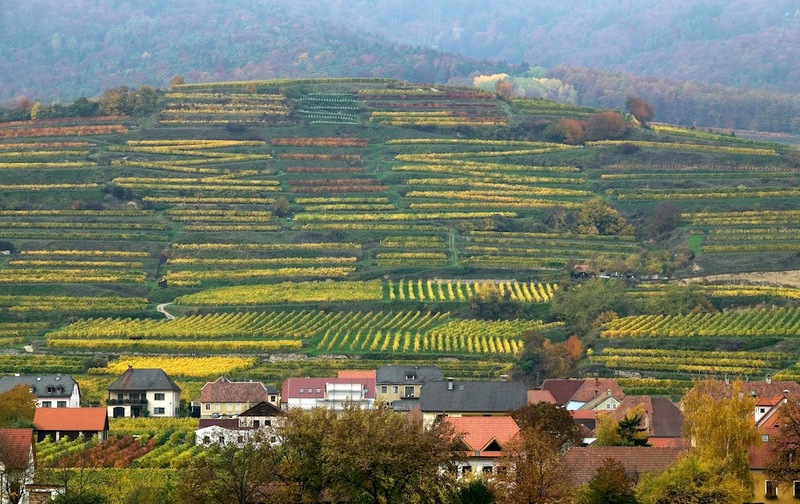 Nothing had been grown there since the nineteenth century and no records about it existed, but tests showed that it was Grüner Veltliner’s other parent and has been christened St. Georgener-Rebe and is being cultivated to see if it is a worthwhile grape to bring back to life in Austrian vineyards. First off, look for the Austrian flag on the top of the bottle capsule – if it is there you have a Qualitätswein, which means it has a ‘protected designation of origin‘ just like A.C. in France, D.O. in Spain or D.O.Cg in Italy. There are also Prädikatswein, which are Qualitätswein with extra information that refers to how ripe the grapes were.This is useful in cool climates where location might not give enough information on its own, but as the Prädikat levels – Spätlese, Auslese, Beerenauslese, Ausbruch, Trockenbeerenauslese, Eiswein, Strohwein / Schilfwein refer to ripeness, which of course is sugar in the grape, they can often be sweetish and the higher levels are dessert wines. If you want a dry wine look for the word trocken on the label – all my examples were Qualitätswein Trocken. There is also a new system called Districtus Austriae Controllatus – D.A.C. on the label – and this works exactly like A.C. in France, D.O. 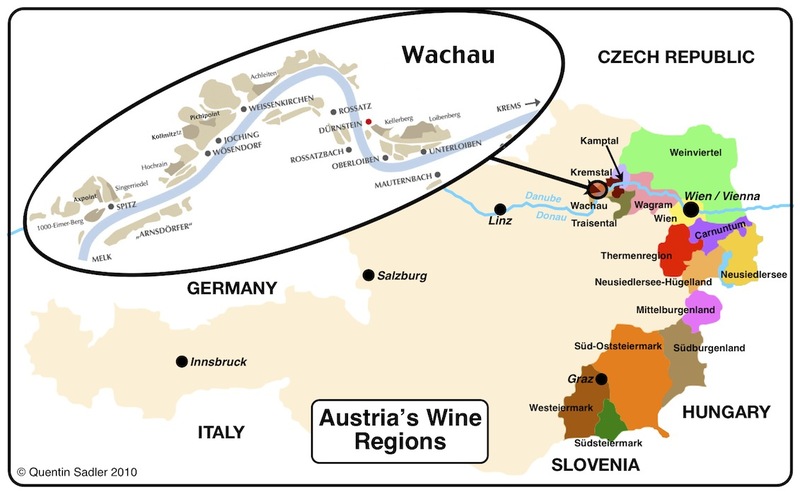 in Spain or D.O.Cg in Italy in that it limits the boundaries of the area and the grapes that are permitted, however so far it only covers 7 out of Austria’s 16 wine regions and Wachau, long the most famous wine region, is not one of them. Steinfeder – this is named after a local grass that grows in the vineyards and is the simplest level with a maximum of 11.5% alcohol. Federspiel – this name comes from falconry, a traditional form of hunting here. These have alcohol levels of between 11.5% and 12.5% and ripeness roughly equivalent to a dry Kabinett. Smaragd (Shmah-rahg’d) – this is named after a striking green lizard that lives in the vineyards. The wines have a minimum 12.5% alcohol and a maximum 9g/litre residual sugar, but most are much drier than that – the wines I tasted were around 2g/litre – think of it as a dry Spätlese. I really like these terms and think they add a romance to the wine, but do not think they are adequately explained on the labels. I have tasted a good many Grüner Veltliners over the last year and have pretty much enjoyed them all, some have been simple and fresh whilst others have been much more intriguing. Recently I was able to taste 6 examples from the Domäne Wachau that were all from the 2009 vintage – I have tasted this producer’s wines many times and I always seem to think highly them, in fact I often show their Rieslings at tastings. Domäne Wachau are based in Dürnstein in Wachau, Lower Austria and are a very quality conscious cooperative whose members control 30% of the region’s best vineyards which are grown on dramatic terraces that sweep down to the north bank of the Danube – they celebrate the terroir of their region by producing an impressive array of single vineyard wines. Wachau and neighbouring Krems seem to me to be stunningly attractive and wildly romantic places and they feature high on my ‘must visit soon’ list. Nice aromatics with that touch of soft spice and a note of minerality. Good acidity, but a richness and succulence a little bit of white pepper as you would expect, peach and apricot fruit too, for me this is slightly softer than crisp, but only narginally. Lovely easy to drink wine, quality general purpose stuff with a fresh appley finish, it will go with a lot of different food, including Asian fare, and make many people happy. A perfect aperitif or wine bar wine for me – 88/100 points. I have recently tasted the 2010 vintage and that is a little fresher, more zippy and quite delicious – it is available in the UK from Waitrose and Ocado. Obviously more intensity on the nose, honeyed with the subtle herbs and aromatics you find in rosemary honey or clove honey. It also feels fresher and more lifted. The palate follows through and is more poised, fine, elegant, not crisp as it has some succulence and texture and lovely peachy, apricot fruit and some mouthfeel like a touch of peach skin – a little skin contact in the winemaking perhaps? The lovely appley finish is beautifully balanced, lasts well and does not lose its freshness and drinkability, again a brilliant wine with a wide array of foods, especially pork and poultry and perfect in a restaurant – 90/100 points. The 2010 vintage is available from KWM wines here. This is a stony mountainside site that retains heat very well, so helps create intensely ripe fruit. The nose was noticeably more restrained with stony and mineral notes and spice scent and blossom rather than obvious aromas. Rich, well knit palate, with an almost creamy ripe quality, a rich texture and succulence of soft cooked peach, apricot and apricot skins. The wine was soft and gently rich, delicious and very drinkable as well as being fine with a pure mineral backbone with a gently appley finish. Really delicious, but not hugely long, which surprised me, but that is a mere quibble. Very clean and fine, glorious wine that I would enjoy with all sorts of dishes, especially fish. The quality of the single site really showed for me – 91/100 points. This was intriguing as it gave off a feel of quality, but the nose was quite closed, with stony notes and hints of spice, floral and blossom notes, Asian pear and ginger. The palate was much more intense and textured, but less obviously flavoursome while clean, mineral, apricot-like freshness came through balancing the rich succulence, while there was real richness on the finish. A lovely wine, but more subtle than the others – 90/100 points. Available from KWM wines here. ‘Point’ means enclosed land making it similar to ‘Clos’ in French. The Pichlpoint site has deep loess soils over the rock and this seems rich soil seems to make richly fruity wines. I loved this, it had a totally different nose, richer and creamier with a vanilla fragrance, hibiscus and pears too making it rich and exotic – I think I feel some old wood in this rather than stainless steel as we have had so far, I know they do use some large old foudres for ageing some of these single vineyard wines. The palate was fat and spicy, saffron and ginger as well as white pepper. It also offered abundant apricot fruit and rich succulence before a lovely freshness kicks in on the finish. A wonderful wine that could grace any dinner table – 91/100 points. Axpoint is right by Spitz which has a cooler climate than further east, the soils too are cooler and create wines which tend to a tight and elegant structure. The nose was fresher, lighter and more fragrant with some lovely clean spices. The palate offered much more lifted fruit with a dry, austere succulence with peach skin notes and elegant white pepper. A lovely, lovely wine with delicate flavours and a nice texture, tight, but with richness. This is not flamboyant, just deep and concentrated with lovely purity and elegance. I thought this was magnificent – 92/100 points. It was a fascinating tasting that really showed the similarities as well as the subtle variations that come about as a consequence of the concentration and differing terroirs. The first three wines had a lively quality to them that really showed in a lively appley quality to the finish, whereas the Smaragd wines were richer and more complex with much more spice and weightier fruit. Because of this tasting and a few other examples, I have come to realise that good Grüner Veltliner nowadays is about much more than acidity. With Riesling acidity is the thing, very often anyway, that is what the wine does – deliver acidity to your palate, some Sauvignon can be like that too. With Grüner the acidity is important to keep the wine fresh, but it is just one component amongst many. This gives these wines broad appeal, good balance and at their best, a beguiling tension between the competing characteristics. Traditionally we were told that the hallmark of Grüner was white pepper spice, again that is there, but it is just one character amongst many with the wonderful ripeness and succulence that modern techniques can coax out of the grapes. If you have not tried Grüner Veltliner, then do yourself a favour, it makes some of the most attractive white wines around and its fame is spreading, New Zealand is now growing a little and I was lucky enough recently to try the 2011 Yealands Estate Marlborough Grüner Veltliner and I thought it was terrific – so you see Gru-Vee’s time really has come and it will conquer the world – both by the Austrian originals being enjoyed worldwide and the new examples that are springing up from wine regions far away from Wachau. Over my 28 years in the wine trade Grüner Veltliner has developed and changed enormously – like most wines. As far as I can recall they tended to be light and fresh with a distinctive white pepper aroma and they were almost always crisp in those days too. Well, it strikes me that modern grape growing and wine making techniques are now producing Grüners with more richness and bigger fruit and they are usually not what I would call crisp anymore. All of which makes them more drinkable and potentially much more user friendly – hence their growing success I presume. If Güner Veltliner’s delights have passed you by, then do yourself a favour and give one a try – it really does make some of the loveliest dry white wines around. 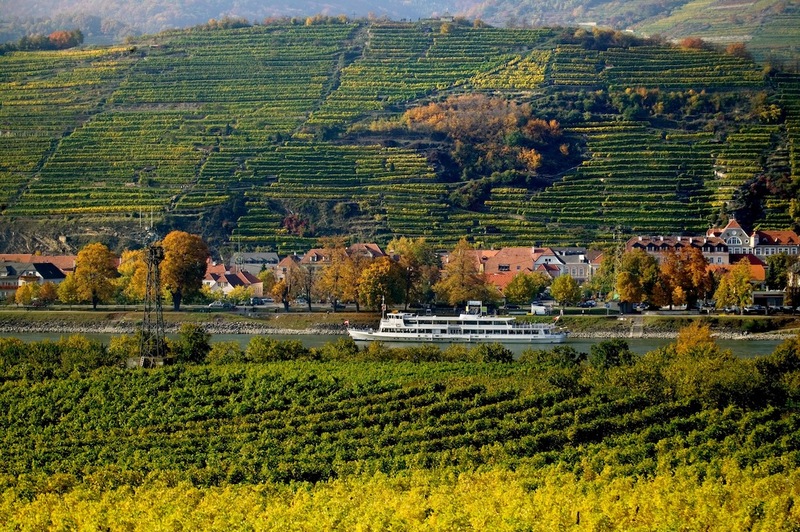 Domäne Wachau wines are imported into the the UK by Alliance Wine and into the US by Vin di Vino. Waitrose has another Domäne Wachau single vineyard Grüner Veltliner available: Domäne Wachau Grüner Veltliner Achleiten Smaragd 2010 – as well as a Riesling. Find a list of UK stockists here.